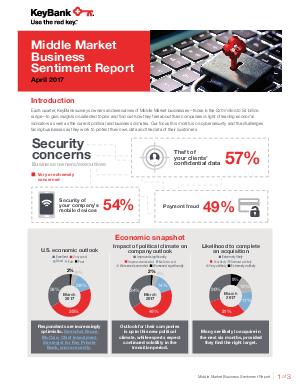 > KeyBank Commercial Banking > What’s on the minds of middle market leaders? Turn to KeyBank to find out. When it comes to the middle market, Key has a dedication like no other bank. Our commitment and focus allow us to deliver relevant, actionable, and tailored solutions for middle market companies. As part of this commitment, KeyBank conducts quarterly surveys with middle market executives. We ask them various questions about business and the world around them to uncover industry views, including how they feel about the state of the economy, security, future growth plans and more. See what’s on the minds of middle market leaders by downloading our latest quarterly report now.